One of the most popular TV trends over the past few years has been the Scandinavian style detective series, usually where some flawed but good hearted character goes through their own personal hell in order to catch a serial killer. And the opportunity to watch one episode after another gives us binge horror. Its not so much Netflix and chill, more like thrill, spill and overkill. The police departments in these series usually have someone they bring in to do a profile of the murderer. Invariably the detective hero dismisses these findings because of some gut instinct of their own based on the fact that their own troubled mind and dysfunctional childhood better qualifies them to understand the motivations of the killer. The viewer always understands this as fair game because the standard profiles offered are always so one dimensional and predictable. Surely soon someone will bring in an astrologer as profiler who will offer an extremely convincing description of the murderer. This would probably be along the lines of weird intense loner type with a nasty Moon / Pluto or Saturn connection. A good example would be Thomas Hamilton, the Dunblane killer with the Sun in Taurus opposite Moon in Scorpio T Square to an apex Pluto. Or Peter Sutcliffe, the Yorkshire Ripper with an 8th house stellium including Mars and Pluto and an exact Moon / Saturn conjunction. Somehow we know where we are with these kind of characters, they are not normal. Even to someone with a limited understanding of astrology, their charts give them away. We just wait for the inevitable Pluto transit to turn all this hidden tension into the unpredictable behaviour of a deranged psychopath. However,what makes us feel really uneasy is that a serial killer might be one of us, a respected pillar of the community, a Jupiter figure rather than a Pluto one. Harold Shipman, the GP who went round bumping off his elderly patients is a classic example. Shipman was a respectable Capricorn with a T Square apex Jupiter. We put so much trust in our doctors to look after us, that if one turns out to have the opposite agenda, its very scary indeed. But this is the trouble with any kind of profiling. Previous experience is useful, but you have to treat each situation as unique. 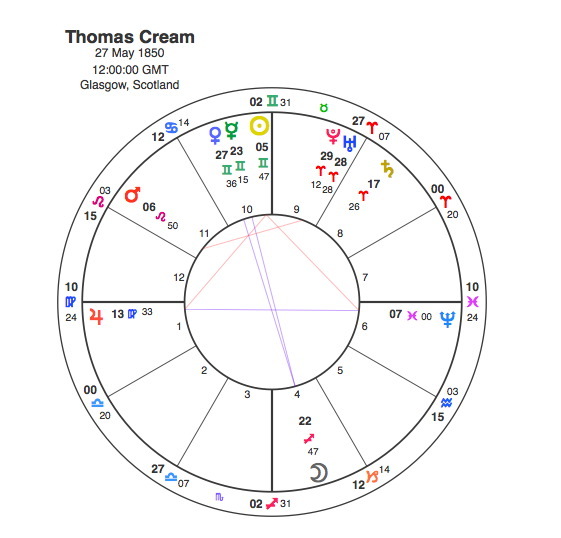 In astrology we have to carefully look at the chart in front of us, particularly if that chart belonged to Dr Thomas Neill Cream, the Lambeth Poisoner. Superficially we see the Sun in Gemini and Moon in Sagittarius, so we would be happy to join Dr Cream’s practice. But if these articles have taught us anything, it is not to get hung up on sign positions. After all even Sutcliffe had a Gemini Sun and Cancer Moon. The one thing that Capricorn Research has learnt over the years, is that if a chart contains a T Square, focus on that. Thomas Cream’s Sun is at the apex of a T Square involving Jupiter and Neptune. Jupiter is in Virgo indicating a fine respected figure ( Jupiter ) in the field of health ( Virgo ). Whenever Neptune is involved you can be sure that things are not what they seem, but this planet also has rulership over intoxicants, drugs of all kinds and even poisons. And Neptune in Cream’s chart is extremely strong in its own sign Pisces. Its also quite interesting to note that Jupiter’s involvement together with the Moon in Sagittarius opposite Mercury in Gemini pointing to quite a bit of travel in Cream’s life. In fact there were a few transatlantic journeys that helped to get him out of trouble for various crimes committed. Also the Moon is opposite Venus so there was always likely to be trouble in relationships with women. Although born in Glasgow Cream was brought up near Montreal. He graduated in 1876 ( his thesis topic was chloroform) and went for post-graduate training in London. He had also made Flora Brooks pregnant and almost killed her while aborting the baby. Brooks’ family forced him to marry her at gunpoint. Flora died in 1877, believed to be from consumption but later events suggested that Cream had killed her. At the time this was happening Saturn was moving through Cream’s T Square, conjunct Neptune opposite Jupiter and square his Sun. He then returned to Canada. In August 1879 Kate Gardener, a woman with whom he was alleged to have had an affair, was found dead in an alleyway behind Cream’s office, pregnant and poisoned by chloroform. Cream claimed that she had been made pregnant by a prominent local businessman but then, after being accused of both murder and blackmail, fled to the United States. At the time of Gardener’s death, Jupiter was in the T Square, conjunct Neptune, square the Sun and opposite its own position. Its interesting that the Jupiter / Neptune opposition has its own pattern. Any transitting planet to it would first hit Neptune at 7 degrees Pisces, so Cream would poison some woman or other. Later the same transit would reach Jupiter at 13 degrees Virgo so he would travel abroad to escape being caught. In fact both Jupiter and Neptune can symbolise getting away with things. Hard aspects to Jupiter can be seen as fleeing the scene of the crime, or perhaps even getting off some charges due to having influence with the authorities. Neptune might also suggest some kind of corruption or a situation where evidence just seems to mysteriously disappear. ” Cream established a practice in Chicago, offering illegal abortions to prostitutes. He was investigated in August 1880 after the death of Mary Anne Faulkner, a woman on whom he had allegedly operated, but he escaped prosecution due to lack of evidence. In December 1880 another patient, Miss Stack, died after treatment by Cream, and he subsequently attempted to blackmail a pharmacist who had made up the prescription. In April, 1881, a woman named Alice Montgomery died of strychnine poisoning following an abortion in a rooming house barely a block from Cream’s office. The case was ruled a murder but never solved. The location, time period, and method make Dr. Cream a likely suspect. On 14 July 1881, Daniel Stott died of strychnine poisoning at his home in Boone County, Illinois, after Cream supplied him with an alleged remedy for epilepsy. Between 1880 and 81, Uranus was transiting Cream’s T Square, square the Sun, conjunct Neptune and opposite Jupiter. Thomas Cream was released in July 1891 when Governor Joseph W. Fifer commuted his sentence after Cream’s brother pleaded for leniency, allegedly also bribing the authorities. True to form Cream sailed to England and took up residence in Lambeth. ” On 13 October 1891, Ellen “Nellie” Donworth, a 19-year-old prostitute, accepted a drink from Cream. She was severely ill the next day and died on 16 October from strychnine poisoning. During her inquest Cream wrote to the coroner offering to name the murderer in return for a £300,000 reward. He also wrote to W. F. D. Smith, owner of the W H Smith bookstalls, accusing him of the murder and demanding money for his silence. On 20 October, Cream met with a 27-year-old prostitute named Matilda Clover. She became ill and died the next morning; her death was at first attributed to her alcoholism. It is quite likely that Thomas Cream would have got away with these crimes, but for his attempts to blackmail and incriminate other doctors. This drew the suspicion of the police and they finally realised that he was the Lambeth Poisoner. On 13 July 1892, Cream was charged with murdering Matilda Clover. He was convicted and sentenced to death and on 15 November was hanged. For the whole period from his release in the US in 1891 to his execution at the end of 1892, Neptune was itself transiting the T Square for the only time in his life. Neptune was conjunct his Sun and square itself and square Jupiter. One interesting thing about Cream’s death was that his executioner claimed his last words were “I am Jack The…”. Despite the fact that Cream was in prison in the US when many of the Ripper’s crimes took place, there was much conjecture that the Lambeth Poisoner and the Whitechapel Ripper were the same person. But as chief astrological profiler to the serial killers of history, Capricorn Research knows that this was not true. In any event the Ripper’s chart would not be a Jupiter / Neptune, apparently respectable poisoner affair. If you want to know who Jack really was you will have to read this – Who Was Jack the Ripper ?